This time, it's all about backstories. Introduced in the Legion, the latest World of Wacraft expansion, artifact weapons are a completely new type of weapon designed to replace many of the weapons players currently work towards. These are intended to be the ultimate weapon for each class and, as such, are some of the most highly respected weapons in the entire Warcraft universe — created and held by countless legends who once walked Azeroth. In short, they’re badass. Each weapon features a unique backstory, some of which are ingrained in the history of Warcraft, that explains how they came into existence and what feats they’ve accomplished in the hands of others. These stories, along with the iconic look of the artifact weapons themselves, make for some pretty exciting additions to World of Warcraft. Here’s a look at some of the best ones making their debut in Legion — based on their backstories and sheer coolness factor. This staff was made from a single branch taken from G’Hanir, the first tree, which was gifted to the mortal druids by the demigod Aviana long ago. Much like the Emerald Dream, G’Hanir wasn’t tied to the mortal world, but accessible through Aviana until she was almost killed by Demons during the War of the Ancients. This single branch has been used by the druids of Azeroth to stabilize and heal the world of Azeroth, and more recently, to hold back the corruption and madness of the Emerald Nightmare. Currently, the staff is being held at a shrine beneath the roots of Shala’drassil. An ancient Highborne runeblade, Felo’melorn was once wielded by Dath’Remar Sunstrider long before the War of the Ancients. Since it first appeared, the sword has been passed down through the Sunstrider family and accomplished many feats in battle. During the [Third War],(http://wowwiki.wikia.com/wiki/Third_War) this weapon was used by Anasterian Sunstrider to fight against Arthas Menethil, but it was shattered by Frostmourne and the fragments were lost. As time passed the fragments were found by Kael’thas Sunstrider and re-forged into a new version of the blade. He wielded it against the Lich King in a battle between the Scourge and Illidan Stormrage’s forces before being forced to flee with the blade to Outland where it has been lost ever since. Forged in elemental lava on the orc homeworld of Draenor, Doomhammer is a weapon connected with the elements, thus its true power can only be unlocked by those who are considered a friend of the elements. The hammer has been passed through the Doomhammer family, originally residing with Telkar Doomhammer, father of Orgrim. Even with a name like Doomhammer, the weapon used for good and upholding the family’s honor. The hammer was passed down to Orgrim by his father, who would wield it for many years as Warchief of the Horde in Azeroth, but it changed hands again in the Second War. During an attempted liberation of his people from the Alliance, Orgrim was killed by knights from Durnholde and passed his armor, as well as Doomhammer, to Thrall, who has used it ever since. 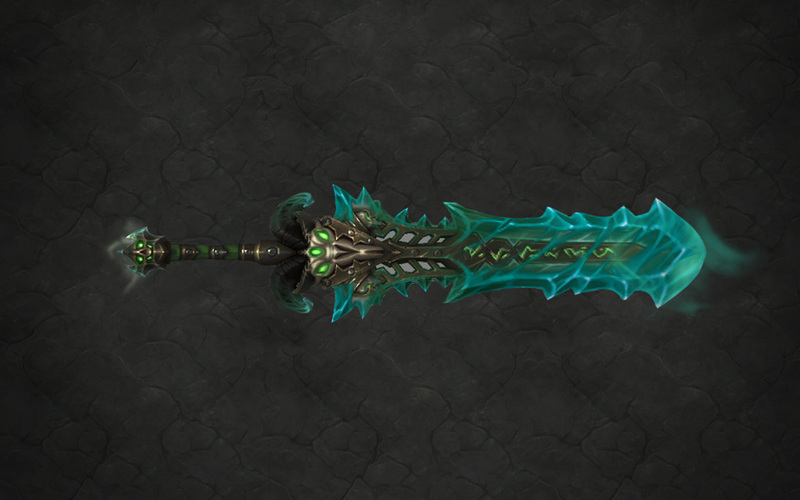 Originally crafted by the Burning Legion in order to corrupt the world of Azeroth from the inside out, the runeblade Frostmourne was used to turn Arthas Menethil into the Lich King. This sword had the ability to drain life from its victims as well as the soul of anyone whom it connects to, trapping their spirit inside the blade. At the end of the Wrath of the Lich King expansion, Frostmourne was shattered into pieces by Ashbringer when Tirion Fordring broke free and ended Menethil’s reign as the Lich King. Following its destruction, countless souls were freed from the broken blade, but others still remained in the shards left behind — which you can forge into two new blades in Legion. Forged by Mangi Bronzebeard from a piece of crystal purified by wielders of the Holy Light, Ashbringer was a sword designed to slaughter the undead plaguing the world. It was originally wielded by Alexandros Morgraine until he was betrayed by his son, Renault, who murdered him with the sword and corrupted it. When Alexandros was resurrected as a death knight, Ashbringer remained with him until his younger son Darion was forced to kill him during his assault on Naxxramas — who claimed the sword and killed himself with it in an attempt to free his father’s soul. By killing himself however, Darion became a death knight just like his father. During the Wrath of the Lich King expansion, he ended up turning on his former Scourge masters and gave the sword to Tirion Fordring, who would go on to defeat the Lich King with Ashbringer by shattering Frostmourne and freeing the souls of everyone the Lich King imprisoned.